When people think about upgrading their TV sound systems without breaking the bank, most explore sound bars. Of course, it’s easy to understand why that’s the first stop everyone makes since they’re incredibly easy to set up and there are plenty of great low-cost options out there. What you might not know, however, is that there are very good surround sound systems out there that cost even less than your average sound bar. 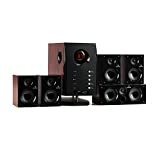 Check out the Auna Areal Active 525 BK 5.1 Channel Home Theater Speaker System, which is on sale right now on Amazon for just $90. It features 95W of power, a 5.25″ subwoofer, five satellite speakers, and Bluetooth connectivity in addition to wired sound inputs. Here’s what you need to know from the product page. ALL-IN-ONE: The Active 5.1 surround sound system comes with a wide range of customizable features and high sonic quality. Elegant design with wooden cabinet and piano black finish. Ideal for home theater use or for connecting to a computer. MULTITALENT: Via the stereo RCA input, a wide array of audio sources (Bluetooth,USB, CD players, MP3 players, laptops and TVs) can be connected to the speakers, allowing you to enjoy a high quality listening experience with all of your audio devices. HOME THEATER: You can now upgrade your personal entertainment system to a proper home cinema. The Areal Active takes the sound from your DVD and Blu-ray players and distributes it to the five stylish satellite speakers and the powerful side-firing subwoofer. HARMONY: The individual components of the system are perfectly attuned to each other. The overall volume and sound balance can be adjusted via remote control or display according to your needs and personal preferences for an optimal listening experience. STYLISH: The auna Areal Active Speaker System guarantees satisfaction for both your ears with its great sound quality and your eyes with its elegant design. It is furnished with a classic brown and wooden case and a front panel in piano black finish.